From 1654 until 1865, "slavery for life" was legal within the boundaries of the present United States. 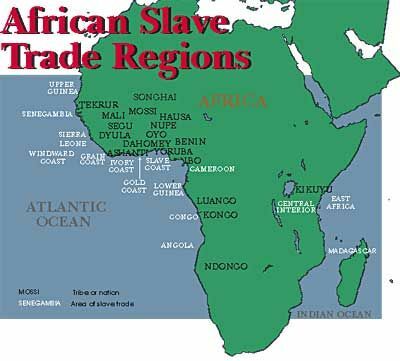 Most slaves were black, and were held by whites; however some Native Americans and free blacks were also held slaves. The majority of slaveholding was in the southern United States where most slaves were engaged in an efficient and established system of agriculture. According to the 1860 U.S. census, nearly four million slaves were held in a total population of just over 12 million in the 15 states in which slavery was still legal. Of the 1,515,605 American families in the 15 slave states, 393,967 held slaves (roughly one in four), amounting to 8% of all American families. Most households, however, had only a few slaves. The concentration of slaves was held by planters, defined by historians as those who held 20 or more slaves. Hence, the planters achieved wealth and social and political power. Ninety-five percent of black people lived in the South, comprising one-third of its population, as opposed to 2% of the population of the North. The wealth of the United States in the first half of the 19th century was greatly enhanced by the labor of African Americans. But with the Union victory in the Civil War, the slave-labor system was abolished in the South and, as a consequence, it led to the decline of the antebellum Southern economy. 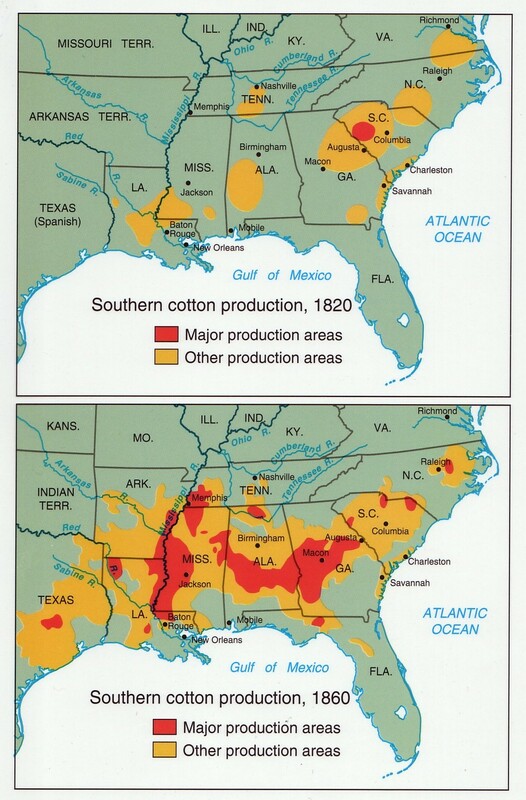 The large southern cotton plantations became much less profitable due to the loss of the efficiencies in the gang system of agriculture. Northern industry, which had expanded rapidly before and during the war, further surged ahead of the South's agricultural economy. Industrialists from northeastern states came to dominate many aspects of the nation's life, including social and some aspects of political affairs. The planter class of the South had temporarily lost power. The rapid economic development following the Civil War, moreover, laid the groundwork for the modern U.S. industrial economy. 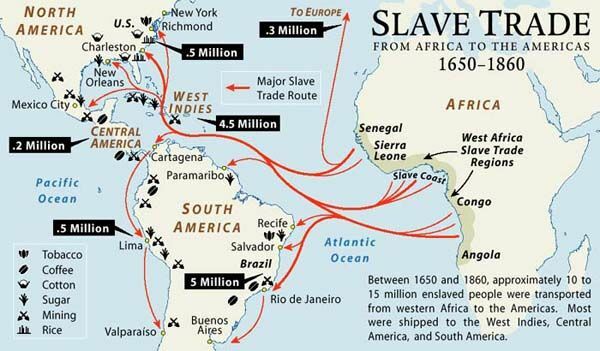 Approximately 12 million Africans were shipped to the Americas from the 16th to the 19th centuries. Of these, an estimated 645,000 (5.4% of the total) were brought to what is now the United States. The overwhelming majority were shipped to Brazil. The slave population in the United States had grown to four million by the 1860 Census. 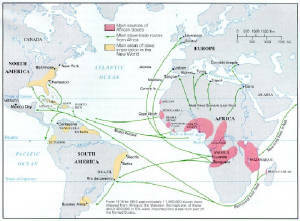 Recommended Reading: The SLAVE TRADE: THE STORY OF THE ATLANTIC SLAVE TRADE: 1440 - 1870. From School Library Journal: Thomas concentrates on the economics, social acceptance, and politics of the slave trade. The scope of the book is amazingly broad as the author covers virtually every aspect of the subject from the early days of the 16th century when great commercial houses were set up throughout Europe to the 1713 Peace Treaty of Utrecht, which gave the British the right to import slaves into the Spanish Indies. The account includes the anti-slavery patrols of the 19th century and the final decline and abolition in the early 20th century. Continued below. Recommended Viewing: Africans in America: America's Journey Through Slavery, Starring: Angela Bassett, Jeremy Rabb, Andre Braugher, Eric Foner, and Kemp Harris (360 minutes). Review: "Everything you thought you knew about slavery is about to be challenged." So says WGBH about its six-hour series Africans in America, and they are absolutely right. Interviews with historians and luminaries such as General Colin Powell, dramatic re-creations of important events, and beautiful photography create a vivid and compelling story of over 400 years of tragedy. Ten million Africans died on the journey to America alone; they and the countless numbers whose lives were wasted in servitude find a voice in Angela Bassett's outstanding narration. At once scholarly and moving, Africans in America should be required viewing for anyone interested in the American condition. While he makes fresh use of those who left their mark in written records (Olaudah Equiano, James Field Stanfield, John Newton), Rediker is remarkably attentive to the experiences of the enslaved women, from whom we have no written accounts, and of the common seaman, who he says was a victim of the slave trade... and a victimizer. Regarding these vessels as a strange and potent combination of war machine, mobile prison, and factory, Rediker expands the scholarship on how the ships not only delivered millions of people to slavery, [but] prepared them for it. He engages readers in maritime detail (how ships were made, how crews were fed) and renders the archival (letters, logs and legal hearings) accessible. Painful as this powerful book often is, Rediker does not lose sight of the humanity of even the most egregious participants, from African traders to English merchants. Highly Recommended. Sources: Otto H. Olsen (December 2004). Historians and the extent of slave ownership in the Southern United States. Civil War History; James M. McPherson (1996). Drawn with the Sword: Reflections on the American Civil War. New York: Oxford University Press; James Oliver Horton; Lois E. Horton (2005). Slavery and the Making of America. New York: Oxford University Press; Robert William Fogel (1994). Without Consent or Contract: The Rise and Fall of American Slavery; Ronald Segal (1995). The Black Diaspora: Five Centuries of the Black Experience Outside Africa. New York: Farrar, Straus and Giroux; Stephen D. Behrendt, David Richardson, and David Eltis, W. E. B. Du Bois Institute for African and African-American Research, Harvard University. Based on "records for 27,233 voyages that set out to obtain slaves for the Americas". Stephen Behrendt (1999). 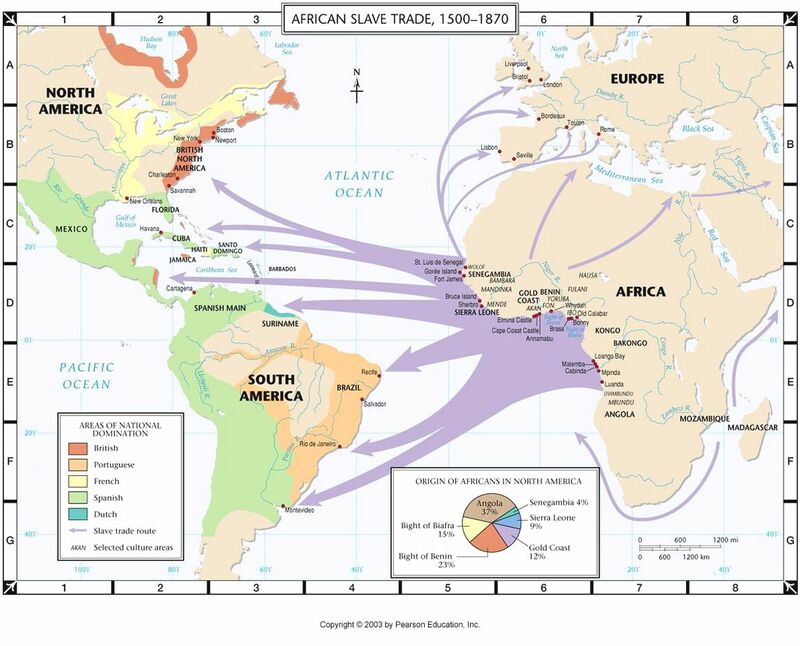 "Transatlantic Slave Trade", Africana: The Encyclopedia of the African and African American Experience. New York: Basic Civitas Books; maine.edu.